I have to tell you, I think ASTRA (American Specialty Toy Retailing Association) gets me. Just like me, they’re not too into commercialism and way more into products that make a child do, think and learn. Which, as anyone who has been reading my reviews the past 5(!) years knows is completely my style of toys. This year, ASTRA created a Best Toys for Kids 2009 list and I’m feeling pretty proud that nearly everything on their list of 21 items is something that we either already own or is on our list for the holidays. Seriously. It was hard for me to highlight just a few. Honestly, the entire list of 21 are all favorites. I just finished adding the few we don’t have to our Amazon Wish List. Here’s hoping Santa’s reading! Automoblox, Wedgits and Green Toys were previously provided as samples for review on MWS. ASTRA sent Bananagrams, Mini Collectible Erasers by BC Office (which are very cute for the stockings) and a Tea Set by Green Toys as a sampling of their awesome list. 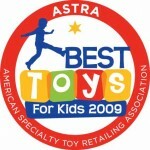 I just wanted to remind everyone that you can get all the ASTRA best toys from the ASTRA member toy stores who picked them! The ASTRA Store Finder lets people find an independent toy store nearby, or an online source in addition to TRU or Amazon.